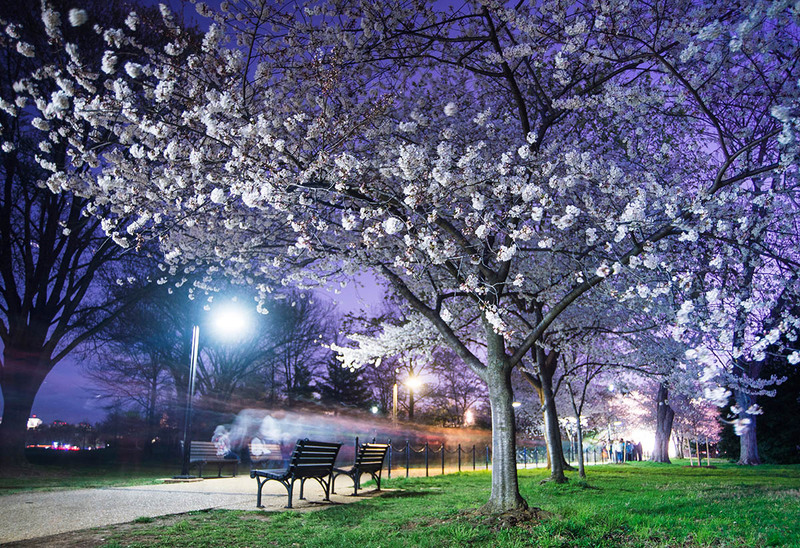 Each spring, the blooming of the 3,000 cherry trees along the tidal basin draws more than a million visitors to Washington, D.C. The stark brown of winter trees is rapidly overtaken by clusters of single white flowers that make the whole area appear as if the trees are dancing in clouds. This is a section of Yoshino cherry trees between the Tidal Basin and Potomac River. I find a much greater peace amongst the trees after dark. In this photo, a lone cyclist zooms by. I don't often see people when I do night photography and I wanted to celebrate the few who do make the trip after dark. When the cyclist whizzed by me, I was set to do a 20 second exposure, and his ghostly impression was captured.